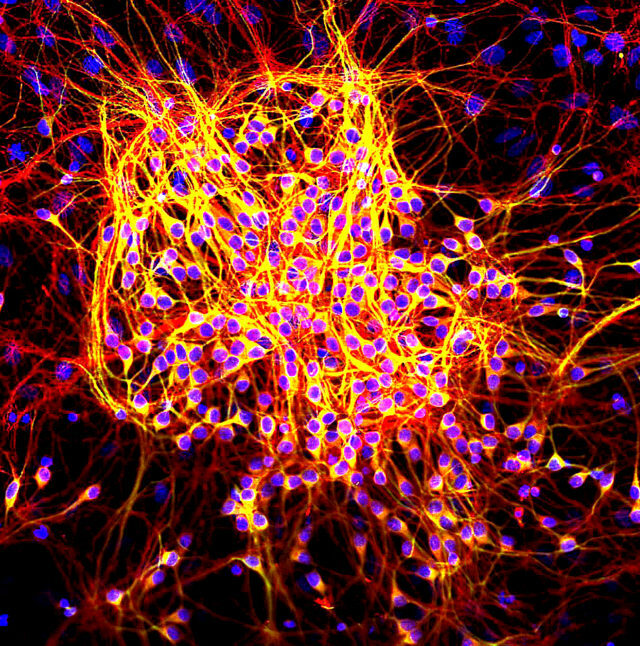 Tau proteins are not evil, but they have certainly made a bad name for themselves; they gained notoriety after scientists discovered the proteins’ role in the development of both chronic traumatic encephalopathy (CTE), a condition tied to repeated concussions, and Alzheimer’s disease. Although tau is frequently featured in the news cycle, the protein remains one of the great mysteries in neuroscience. There are many processes involving tau that we have yet to understand, but scientists have learned a little about how the protein functions both normally and in brain disease. When functioning properly, tau is one of the many proteins that help stabilize microtubules, the structures within the cell that help with cell movement, division and transport of materials. Tau proteins are present in every human brain and central nervous system, specifically in and around our neurons. They are most concentrated in the cell’s axon, a projection from the cell body unique to neurons that allows cells to communicate with one another through electrical signals. 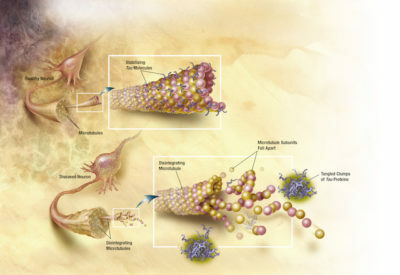 Researchers believe that tau helps stabilize the microtubules in the axon to facilitate transport of these signals, according to James Hendrix, director of Global Science Initiatives at the Alzheimer’s Association. “Different messages run back and forth along the microtubules, and the tau protein is kind of like railroad ties: it helps to hold that structure together,” he says. Problems arise when the protein forms incorrectly, making it unable to perform its designated task: assisting in stabilizing microtubule structures. The malfunctioning protein gathers elsewhere in the cell with other abnormal taus. These accumulating proteins then form clumps, known as “tau tangles.” When the microtubules are left unsupported – without their railroad ties – the cell’s transport mechanism breaks down, ultimately leading to cell death, says Dr. Alvaro Pascual-Leone, professor of neurology at Harvard Medical School. These tangles spread from neuron to neuron, eventually leading to mass cell death, Pascual-Leone explains. However, Hendrix notes that we have yet to discover how these malfunctioning proteins move between cells. As the progressive cell death continues, the brain shows signs of atrophy, which is when we see the memory and behavioral symptoms associated with both Alzheimer’s and CTE, says Pascual-Leone. Although researchers have identified these clumps of tau proteins as major contributors to both Alzheimer’s and CTE, they largely do not understand why these tau tangles form in either disease. In CTE, for instance, multiple head traumas, such as concussions, are thought to eventually trigger abnormal formation of the tau protein. But researchers do not understand the mechanism, notes Pascual-Leone. Researchers also do not know if trauma itself is enough to trigger the process, or whether there are other factors – genetic predisposition for example – that contribute to progression of the disease. “From the trauma to the misfolding of the protein, there is a gap of knowledge,” he says. While head trauma is related to tau tangle accumulation, there are likely many steps in between both events, Pascual-Leone adds. With Alzheimer’s, the waters are even more murky. There could be many reasons why these abnormal tau proteins accumulate, whether it’s the malfunctioning proteins themselves or if the normal processes that clear out these tau tangles stop working properly. Understanding the mechanism that forms these tau clumps would be a major win for researchers, Hendrix says. They could then identify when the process starts, find out if it is preventable, and use interventions – whether it be medication or lifestyle modifications – to prevent or delay the onset of symptoms.